Tune in to Studio A, Sunday, February 19 from 9:00-10:00 PM EST for a live, in-studio reading and interview with poet Diana Delgado. 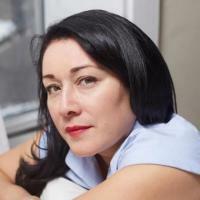 Delgado received her MFA in Poetry from Columbia University and a BA in Poetry from University of California, Riverside. Her poetry chapbook, Late-Night Talks With Men I Think I Trust, selected by Cornelius Eady, won the Center for Book Arts 2015 Poetry Chapbook Competition. Her poetry has appeared in Ploughshares, Ninth Letter, The North American Review, Prairie Schooner, TriQuarterly and Fourteen Hills. She has been awarded numerous awards, with the most recent from Bread Loaf Writer’s Conference and The Frost Place Conference on Poetry. A poet and playwright, her work is rooted in her experiences growing up Mexican-American in Southern California.